Striped bass, or stripers, are among the most exciting gamefish in the water. Those unfamiliar with stripers can be a bit leery on their first time out, but there’s nothing timid about the way a striper hits a lure, especially topwater lures like surface plugs, crankbaits, or jigs. A striper doesn’t strike a lure; it smashes it with a vengeance and blows it to kingdom come. 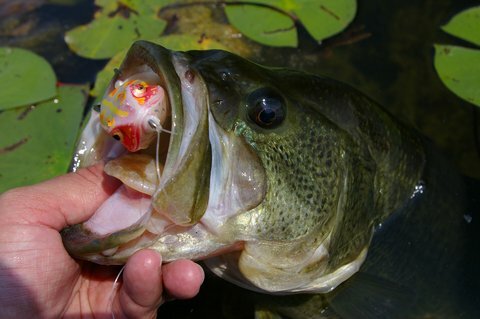 Fish topwater lures anywhere you see stripers breaking the surface, even in open water. You’ll also get results working topwater lures across shallow flats, in protected coves, against bluff banks, or in river eddies. The bigger and noisier the topwater lure the better, too, especially in choppy water or low light conditions. Then, as it gets lighter out, switch to quieter, more realistic lures. Here are a few favorite topwater lures for striped bass. These are the first lures you’ll want to use early in the morning and the last ones to cast before darkness falls. They’ll also produce throughout the day if it’s cloudy, or there’s a chop in the water. Prop baits are known for attracting big fish, so if the stripers in your local waters run in excess of 20 pounds, prop baits are the way to go. Stripers often strike or roll on prop baits repeatedly without hooking up. When this happens, twitch the lure gently, making the props barely sputter, which will draw a second strike. Solid prop baits to use for stripers include Luhr-Jensen’s Big Game Woodchopper, Cotton Cordell’s Boy Howdy, or Heddon’s Wounded Zara Spook. Favored by anglers searching for schooling fish, these noisy lures will work well in low-light or choppy conditions. Furthermore, you can cast them a mile, which makes them useful when a school of stripers is moving around quickly. I’ve found that, for some reason, poppers are magic in churning tailwaters downriver from dams. If you’re looking for poppers, check out Arbogast’s Hula Popper, Gary Yamamoto’s Shibuki Popper, or Heddon’s Lucky 13. Easily the most popular topwater striper lure, surface minnows work well in bright sunlight, but their best application is early and late in the day. With surface minnows, use a slow, swimming retrieve, keeping the rod tip high while reeling the lure just fast enough so it shakes back and forth across the surface, leaving a wake behind it. Go-to surface minnow lures include Cotton Cordell’s Red Fin, or Storm’s Thunderstick. Last, but not least, you have stick baits, which work exceptionally well in moderate light, or when the morning fog begins to break up. The erratic “walk the dog” action that stick baits offer is hard to beat when you’re targeting stripers. For the best results, use a rod six feet or less, and point the rod tip to the water’s surface as you retrieve the bait, snapping the slack out of the line with a single downward stroke at the same time you turn the reel handle. I like Heddon’s Zara Spook and Bomber’s Badonk-a-donk.